Jim Hawkins races to beat Long John Silver to the riches awaiting on Treasure Island. An animated retelling of Robert Louis Stevenson's classic novel, featured the main characters as animals. A Mysterious Map, A Hidden Treasure, The Greatest Adventure Of All! Kids love this animated classic! Robert Louis Steven's adventure tale has been told many times, but never before in such a wonderfully animated manner. The characters -- all cute animals, reminiscent of Disney's best -- are adorable and enchanting. The plot execution is kept brisk and humorous, so as to not frighten small kids. Our kids have watched their TREASURE ISLAND dozens of times, preferring it over THE LION KING, POCHAHONTAS, HERCULES and TARZAN. 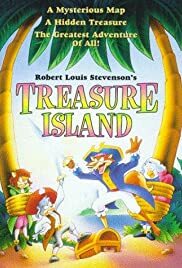 If you long for the feel-good animated adventures that Disney used to make, you'll love TREASURE ISLAND.